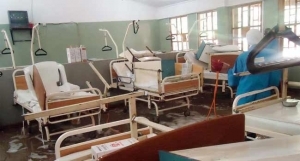 The continued industrial action by Joint Health Sector Unions (JOHESU) at the Jos University Teaching Hospital (JUTH), is taking its toll on health services to the public at the Tertiary Health Centre. Members of the unions maintain that until their demands are met, there is no going back to work, despite pleas from the management that the public should be considered. Chairman of the Union, Mustapha Kabir, declared the continuation of action against some decisions of the management. He noted that the management failed to honour the agreement reached on a memorandum of understanding with JOHESU. The congress mandated the unions to resume the suspended strike until the demands are met leading to activities at the hospital running at slow pace with only medical doctors and consultants attending to patients. The management of JUTH, however, differed on some of the allegations, explaining that some issues raised by the unions will be solved at the national level, while those for the hospital are receiving attention. With the industrial action running for more than two weeks, both the unions and management of JUTH need to come to an agreement for work to resume immediately, as patients are the most affected.